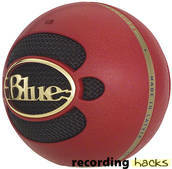 The Kickball is an “active dynamic” microphone — a dynamic mic with a built-in phantom-powered output balancing circuit. Designed specifically for kick drum, it finds applications around other low-frequency instruments, such as toms, acoustic bass, and bass cabinet. The Kickball was well suited to an open, jazzier sound with less hype in the high and low end. On some of the rock kicks, however, it sounded a bit murky, especially when compared to the beefy Beta52 and snappy D112. The kickball picked up a low-mid wash from cymbals and rest of kit and sounded a bit wooly and tubby in comparison to the other mikes. A little EQ helped … the Kickball became quite usable. [It] sounded great on floor tom, bringing life to the bottom end and capturing big lows and lots of tone. The sound is comparable to that of the Sennheiser MD421, though a bit less dynamic. The Kickball sounded bigger than the e604… the darkness of the mic actually helped diminish cymbal bleed.